An easy healthy snack that requires no baking at all. These peanut butter energy bites are so easy to make. Plus they are packed with flax seed, dried fruit, and more. Here’s a delicious no-fuss holiday appetizer recipe made with red wine, fresh cranberries, and orange spice tea. Served over warm brie, it’s easy and delicious. Jack o’ lantern marshmallow peeps recipe made with Turmeric Chai Golden Latte by Numi Organic Tea. A delicious and spicy homemade Halloween treat! Looking for a delicious twist on a classic PSL beverage, try this turmeric-based pumpkin spice chai latte recipe that is coffee and tea-free. Here is a fun spin on traditional Alfredo sauce. This recipe is Italian cuisine meets California, adding delicious avocado to this wonderful sauce. 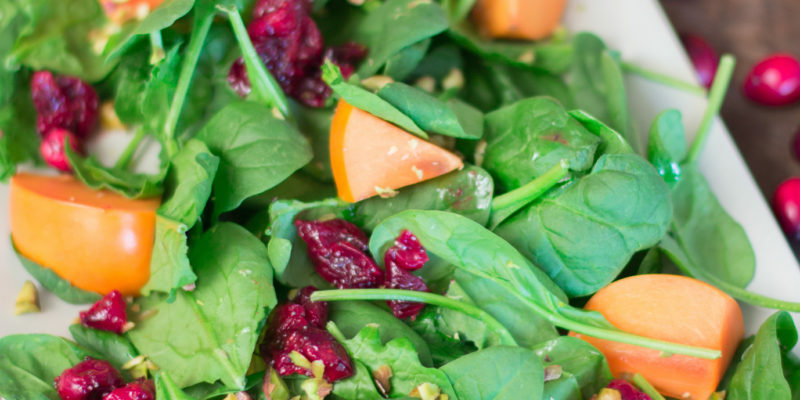 Roasted cranberries and fresh fuyu persimmons make this salad the perfect compliment to fall cuisine. This recipe is healthy, tasty and simple to make. Love salted caramel? This dessert recipe is a Asian-inspired twist on the classic flavor combo, using soy sauce. Homemade kiwi fruit and strawberry shaved ice made using Numi Organic Teas. This childhood classic is 100% preservative free! A delicious hearty and healthy veggie burger recipe made with black beans and roasted corn, that is easy to make and easy to make vegan if you like. Move over potato fries, these delicious and easy to make avocado fries are not only healthy, because they are baked, but are super delicious.